Growing up I was a very picky eater, and never had patience to sit down and finish my meal, I had better things to do than eat – bike races, or water wars for example. To ensure that I would finish the meal – my grandma would fix a plate for me, sit next to me and start telling me her wonderful made up fairy tales, stories one could never find in any book. The stories never ended with the meal, grandma told me that she would finish the story at the next meal, and I ran to the dinner table for the next meal just to hear the ending. Meatballs over mashed potatoes with tomato & cucumber salad dressed with dill, salt and sour cream, used to be my favorite meal, and I didn’t need stories to keep me in one place for the duration of the meal. When my kids were very little getting them to eat their vegetables was challenging. I would sneak vegetables into all kind of food. 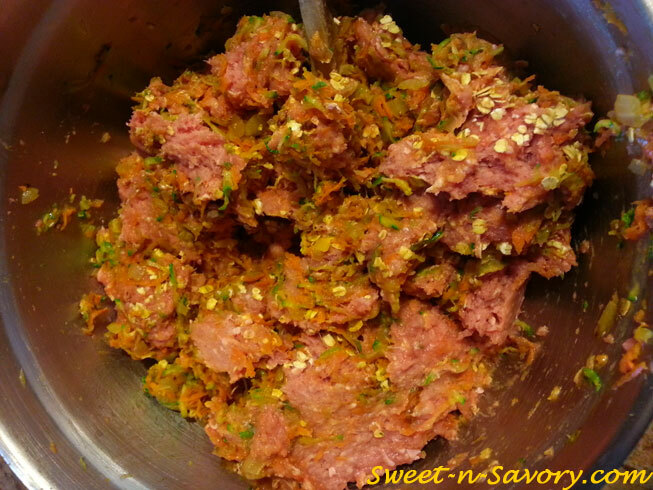 Ground meat and fish was a perfect disguise for veggies, and so I came up with this variation of meatballs that features quick sauteed onions, carrots, and zucchini in the meat mix and carrots with caramelized onions in the tomato sauce . When I have bell peppers – I add finely chopped bell peppers to the meat mix and to the sauce as well. My kids love them over whole wheat pasta or garlic and cauliflower mashed potatoes ( just don’t tell them about the cauliflower). 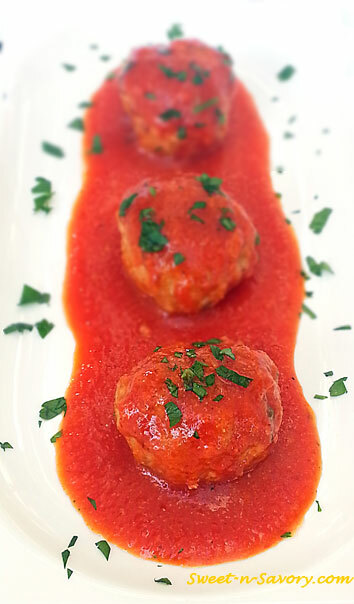 My oldest son calls these meatballs his ultimate comfort food, and I am very happy that his comfort food, also provides him with adequate nutrition and health benefits. 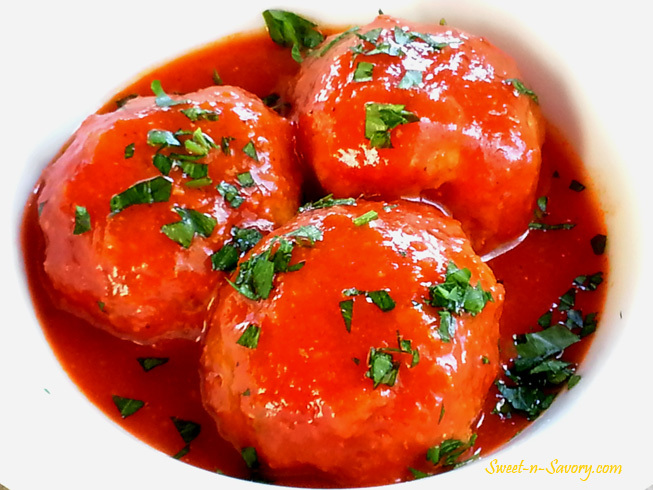 * The sauce for these meatballs should be prepared in advance and brought to simmer in a large pot. 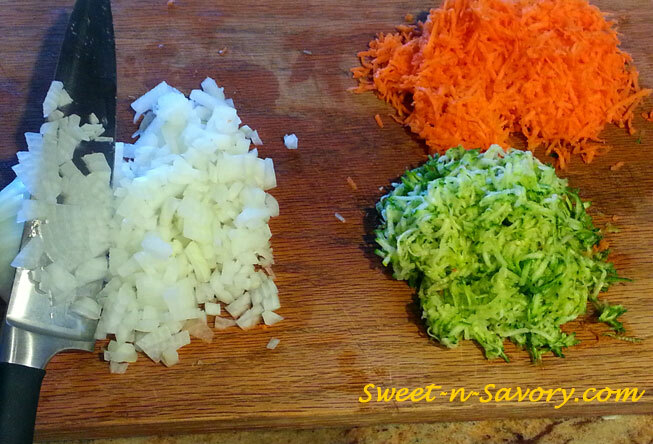 Finely chop 1 onion and bell pepper (if using), finely grate 1 carrot and zucchini. Heat 1/2 tablespoon of oil in a skillet over medium high head add onions and saute until translucent and fragrant, about 5 minutes. Add the other vegetables and parsley (if using) to the onions and saute for another 3 -5 minutes until soft. Cool the vegetable mixture. * This is a good time to prepare the sauce for the meatballs. Place ground turkey in a bowl, add cooled vegetables, salt, pepper and Worcestershire sauce and mix well. If the mixture is too watery – add oatmeal. Bring a small pot of water to a boil, place a teaspoon of meatball mix into the pot and cook, taste the meatball and adjust the taste. Set oven to high broil. Line a cookie sheet with aluminum foil or parchment paper and lightly oil the cookie sheet. 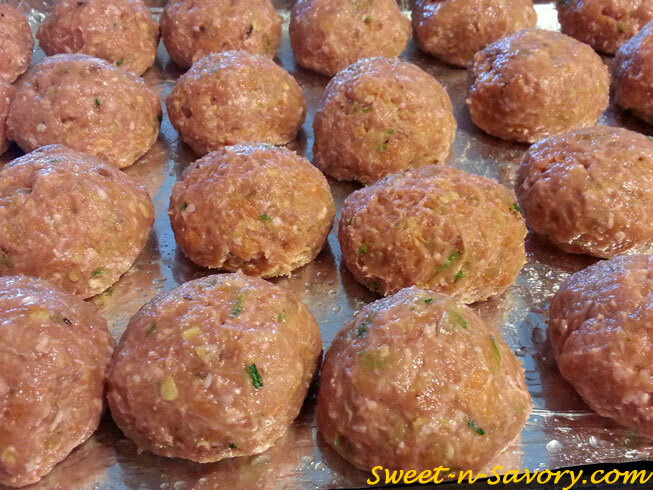 Form meatballs and place them onto the cookie sheet. Place the cookie sheet into the oven on the rack about 5 inches from the heat source. Cook meatballs for about 5 minutes. Turn them over and cook for another 3 minutes. the meatballs should have some color on them while still pretty much raw inside. This technique seals the juices for a juicy and tender meatball. Heat 11/2 tablespoon oil in a dutch oven or a large enough pot to hold the meatballs. Add sliced onions and saute on medium high heat until caramelized. Add carrots to the onions and saute for about 5 minutes. If using bell peppers add them together with carrots. 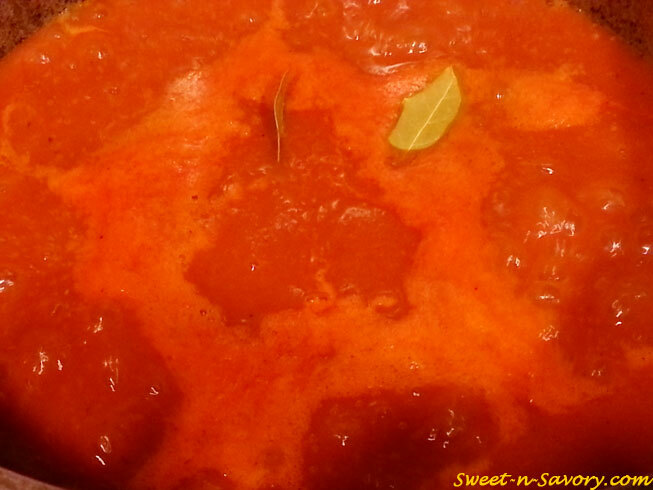 Add crushed tomatoes, chicken broth and tomato paste to the vegetables and bring to a simmer. I usually puree the vegetables at this point, but you may choose to leave them as is. 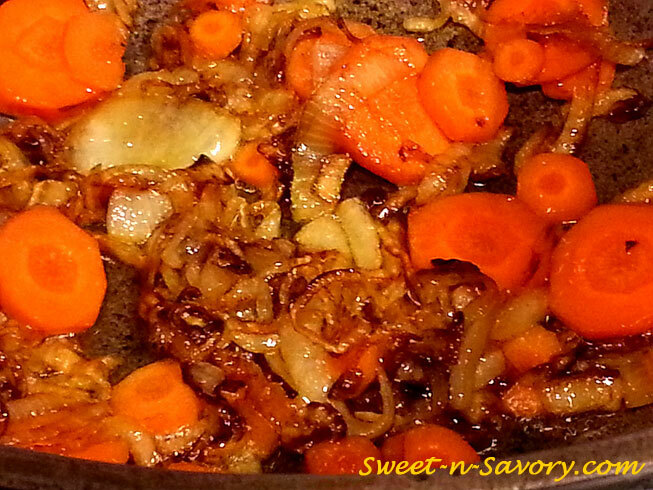 The sauce should be a little sweet and a little tangy, usually the caramelized onions and carrots provide enough sugar for the sauce. Adjust the taste with salt and pepper, sugar and lemon juice. Add meatballs 2 bay leaves and parsley to the sauce,. Cover and cook on low for an hour. Serve over pasta, mashed potatoes and Enjoy!